This morning, on the heavily traveled Boulder Creek Path, a person called out to me, "Dude, you need to eat more!" I was mostly happy to get a more creative comment than the typical "Run Forrest, Run!" (my head and facial hair choices don't help much), but I'll also take it as an indelible signifier of peak fitness. I've made it unscathed. I'm prepared; all that is left to do is rest. The last ten weeks of training have been remarkably consistent and (historically uncharacteristically) reasonable in their volume, starting with the second week of June: 106 miles (first week really back after two months of very little running due to knee issues), 154, 150, 156, 151, 183, 113 (White River 50 taper), 155, 180, 142 (half taper week). This comes out to 22-28 hours per week of running all above 10,000' and with a heavy emphasis on vertical gain. Because running up and down mountains is what I prefer. I have done runs of 40 miles or more five times this summer, including the final 50 miles of the Leadville 100 course in 6:58 ten days ago. Two years ago I did that exact training run two weeks out from Leadville in 7:26 and ran 16:14 during the race. I am excited to see what Saturday reveals. Last Thursday I finally made it down to Grays (14,270') and Torreys (14,267') for a go on those peaks. I was in a hurry and thus didn't have time for any sort of warm-up from the Bakerville parking lot (the road climbs steeply right from the start), and consequently ended up putting in a quite casual effort to the summit of Grays in 1:28:27. Jeff V informed me over the weekend that that is a Fastest Known Time for an ascent from Bakerville, so I thought I would mention it mostly to just get the splits and time in a public venue for record-keeping purposes. I am pretty confident that right now I am in shape to go probably two minutes faster to the trailhead and another two or three minutes faster from the trailhead to the summit if I put forth a focused effort, so if I don't get the time to get back up there this fall with fresh legs someone else should certainly go improve upon this roughly 4500' climb. Grays Summit, 1:28:27 (for a 56:07 from the trailhead; I believe Jeff has hit this fresh in 54:38). Of course, I did the extra 500' of vertical descent and ascent for the obligatory summit of Torreys Peak as well. Good for you. Run your best. No gel failures this time on Hope Pass. Hope you do get some rest. 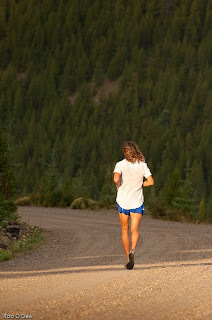 You seemed guilty when I asked you if you ran the day before the Leadville Marathon. Been awaiting your big 100 comeback since you got postponed out of WS100 last year. Break that course record and I will buy you dinner when you get down here. That should help with that weight problem -- at least for a day. Run, Tony, Run. Good luck! Forget about Lance, this is your town. All the best for a great race. It sound like you are going to kill it. Here's my advice. Run the first 50 fast, turn around, repeat. Be careful of Matt's ghost, but don't let it spook you! Run strong Tony. It's exciting to have so many local boys at the front of such a big race. Get em, Matt C's record has stood for too long. thanks for your inspiring blog and all the best for your run from Germany! Good Luck Tony. I saw you running up Gregory canyon last Tuesday, you looked like you were floating up the trail, so smooth. I ran Grays in ~1:30 two years ago and then ran 2:35 on Pikes, so I think Carpenter could probably run ~1:15 on Grays. Psyched to see what you can do this weekend. Sounds like you are ready to rock it! Tear that course up, Tony! I would wish you luck but luck is for the ill prepared. I can offer you this. When you have trained correctly, stayed healthy (read injury-free) and made it to the starting line others will be hard pressed to better your performance under any conditions. It's been a pleasure reading of your adventures and my thoughts will be with you as head out my door to run this weekend. Like many, I will be thinking about you during the run. Relax, enjoy and have fun and the end result will be great!! Good Luck!! Folks who follow Anton's running might enjoy the following interview with Anton in the days leading up to the 2009 Leadville 100: http://blog.irunfar.com/2009/08/video-interviews-with-anton-krupicka.html#krupicka . Be careful of Matt's ghost, but don't let it spook you! Don't let the reroute slow you down! Good luck!!! you will get #1. Haha, "Run, Forrest, run!" Try living and running in Savannah. My XC team gets that everyday from bus loads of tourists, and their tour guides like to make it even more annoying by blasting things like, "Hurry up! You're going too slow!" over their loudspeakers while pacing us. There is also a trumpeter on River Street who plays the Rocky theme any time we pass. Have fun tomorrow! You got this. I'm looking forward to seeing Matt's record fall. Looks like you DNF'd going for it. Congrats on the cajones to try and nab the record.